On 20 March, Wednesday, a Public Lecture by Her Excellency Ms. Anna Joubin-Bret, the Secretary of UNCITRAL, was organized by AALCO and the Ministry of External Affairs, Government of India, at the AALCO Secretariat, New Delhi. The Lecture was attended by High Commissioners, Ambassadors, and Liaison Officers of the Member States of AALCO, officials of the Ministry of External Affairs, Government of India, and other noted academicians and trade law experts. 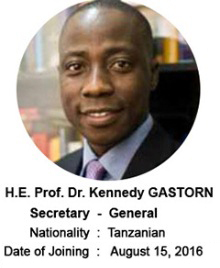 Secretary-General of AALCO, H.E. Prof. (Dr.) Kennedy Gastorn, in his welcome address firstly thanked the Government of India for wholeheartedly supporting and taking an active part in all affairs of the Organization. He explained the growth of AALCO into a permanent regional organization today that acts as a forum that has immense significance for the African-Asian solidarity and interests. Further mentioning the long-standing relations between AALCO and UNCITRAL, as well as the recent broadening of activities of the UNCITRAL, he invited H.E. Ms. Joubin-Bret to deliver her Lecture. Dr. V.D. Sharma, Additional Secretary and Legal Adviser, Ministry of External Affairs, Government of India, in his address also mentioned of the long-standing relations between UNCITRAL and India, with India being one of the founding Member States in the group of 60 at UNCITRAL. He further introduced in brief the subjects undertaken and presently under consideration of the Commission. He commended the Commission for its work in the forms of model laws, conventions, legislative guides and robust debates in working groups, through which the Commission has provided a valuable platform for countries to adopt principles of international commercial and trade law appropriate for their circumstances and suitable to their conditions. Lastly, he pointed the non-political nature of the objectives of the Commission – the promotion and development of laws and regulations that would have the potential of being accepted by countries with little resistance – as a reason for its success. H.E. Ms. Anna Joubin Bret, in her lecture explained in brief the nature and functionality of UNCITRAL, which was established in 1966, as a legislative organ of the UN established for the purposes of unifying laws. She thereafter proceeded to explain in brief the 6 Working Groups of UNCITRAL, which included the following subject-matters: Micro, Small and Medium-sized Enterprises, Dispute Settlement, Investor-State Dispute Settlement Reform, Electronic Commerce, Insolvency Law, and Judicial Sale of Ships. Regarding the subject-matter of Working Group I, Micro, Small and Medium-sized enterprises, she mentioned that they were the foundation of the international economic structure, and that the UNCITRAL, amongst other things, is attempting to merge them into the formal sector, so that they will be able to contribute more to the global economy. Regarding Electronic Commerce, which is the subject matter of Working Group IV she referred to the latest development, which is the data privacy law, an area where UNCITRAL would want to have a discussion with more and more stakeholders, including AALCO. She also spoke about the upcoming successful 40 years celebration of the United Nations Convention on Contracts for the International Sale of Goods. Further, with respect to the Working Group II - Dispute Settlement – she spoke about the more recent UNCITRAL Model Law on International Commercial Mediation and International Settlement Agreements Resulting from Mediation (2018) – designed to assist States in reforming and modernizing their laws on mediation procedure, thereby attempting to turn mediation into a conclusive dispute resolution mechanism, instead of merely being a useless first step before arbitration. She encouraged Member States to participate in the discussions leading to the adoption of the said Model Law. She generally encouraged AALCO Member States to actively and effectively participate in all the UNCITRAL’s Working Group discussions, so that the resulting Conventions and Model Laws may truly have the capacity to have a universal application. The lecture by Ms. Joubin-Bret was followed by an enriching interaction between the speakers and the audience.